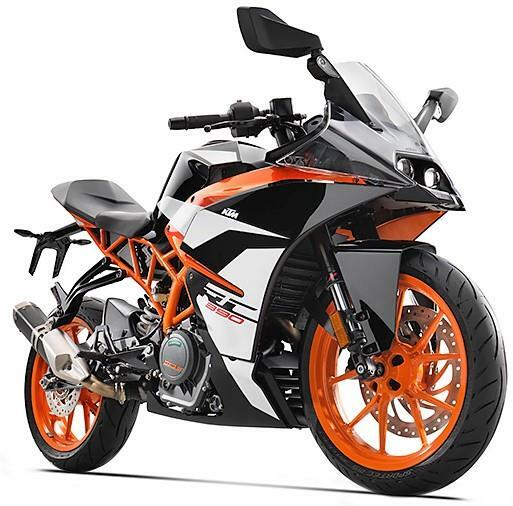 KTM RC 390 is a middleweight sports bike with full fairing, good riding dynamics, superb performance, and good safety features at an affordable price. 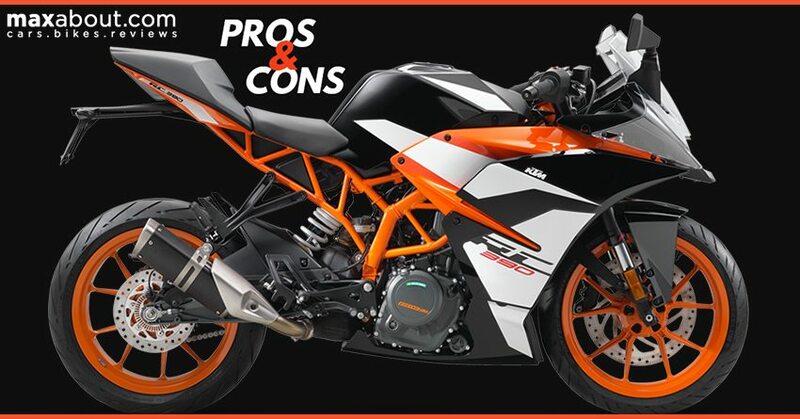 As everything comes with a downside too, here are the pros and cons of KTM RC 390. 1. Stunning Looks – No one and not even you can escape from the bold and charming beauty of the RC 390. Some of the stylish parts of RC 390 includes a distinctive headlight cowl, twin projectors, LED pilot lamps and RVM mounted turn blinkers. RC 390 has got a full-faired body, giving it a SuperSport motorcycle appeal. 2. 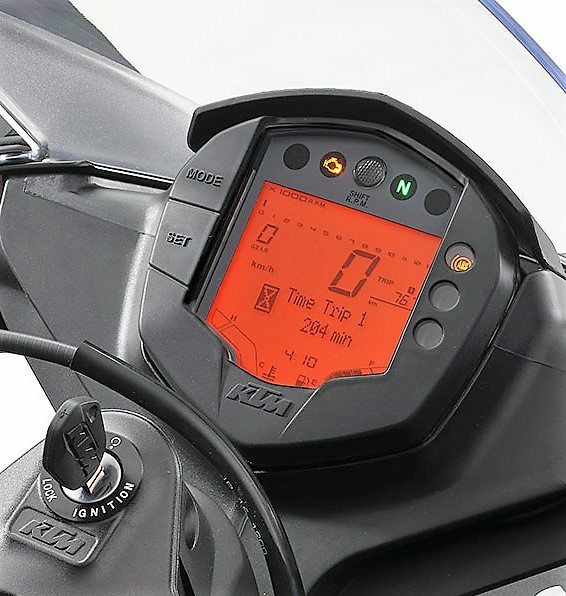 Highly Usable Instrument Cluster – Yes, the KTM RC390 has got a fully digital instrument console which offers you 37 different pieces of information. 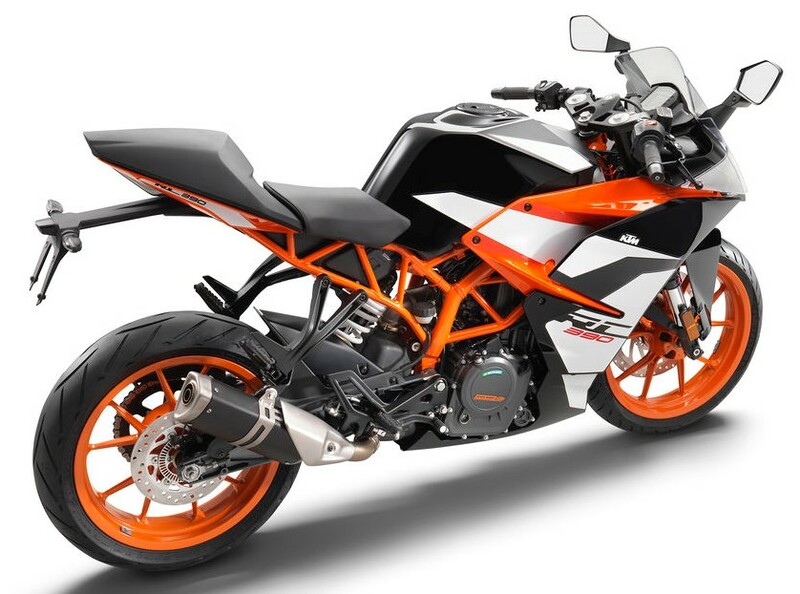 However, a newer unit is available with KTM 390 Duke and will make into the RC 390 with the next update. 3. Brisk Acceleration – RC 390 simply loves to play with speed. It jumps from 0 to 100 kph in no more than 6 seconds. You would enjoy the ride as the motor of the RC 390 loves to be revved hard. The top speed is equally fascinating as the initial acceleration. 4. Metzeler Tyres – The sticky Metzeler tyres have not just enhanced the classy looks of the bike but they have even improved the handling dynamics of the KTM RC 390. Buyers do not need any upgrade regarding the tyres at all. 5. Efficient Braking System – RC 390 comes with a 320mm front and 230mm rear disc brake. Also, not to forget, 2-channel ABS comes as a standard on RC 390. The Bybre sourced disc brakes work perfectly even in case of hard braking and save the rider from every possible obstacle. 6. Slipper Clutch and Ride by Wire – Slipper Clutch lets you jump between gears with ease as back torque gets limited through this technology. Ride by wire smoothens the overall performance and will help KTM bring more features like traction control or launch control in the future. 7. 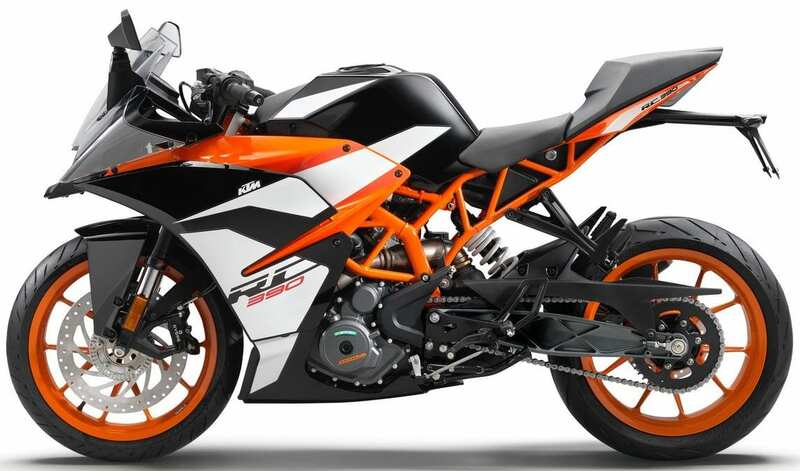 Powerful Engine – KTM RC 390 is the most powerful sports bike in India in its price range. The 373.2cc single cylinder engine generates maximum power of 43.5 HP at 9000 rpm and maximum torque of 36 Nm at 7000 rpm. The engine is mated to a 6-speed gearbox. The approximate top speed of the bike is 175 kmph, and the real-world mileage is around 24-28 kmpl. 8. Mouth Watering Price – Priced at INR 2.41 lakh (ex-showroom Delhi), the KTM RC 390 is definitely a mouth-watering offer. A stylish, good performer with a good handling package! 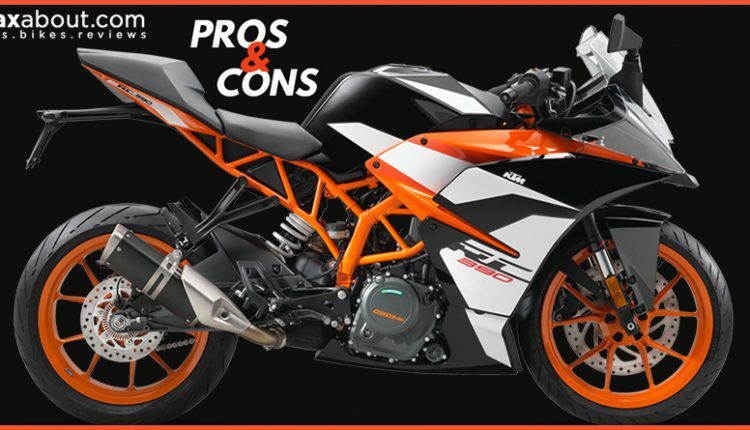 So, the price is justified when compared to Honda CBR250R ABS (Rs 1.95 lakh), TVS Apache RR 310 (INR 2.23 lakh), Yamaha R3 (Rs 3.49 lakh), Benelli 302R (Rs 3.70 lakh) and the Kawasaki Ninja 300 (Rs 2.98 lakh). 1. Lacks Fit and Finish – Since RC 390 is a premium offering, visible wires don’t really suit its personality. But we must add that the motor did feel a bit vibration-friendly on idle but once you set in motion it irons out with a raspy exhaust note in the background. 2. Heating Issues – This continues to remain the biggest concerns with the KTM RC 390. KTM engineers say that they have worked to direct the airflow from the fans towards the ground along with an additional exhaust fan for better cooling. But this doesn’t seem so effective when it comes to riding in real-world conditions. 3. Aggressive Riding Position – The clip-on bars and rear-set footpegs make the riding posture aggressive and uncomfortable in real-world conditions. The situations get worse with a thinly padded seat. So, this makes it uncomfortable for long distance touring. 4. Stiffened Suspension – Just to improve the handling of the bike, the suspension of the KTM RC 390 has been stiffened. The suspension travel of the WP sourced USD front forks has been reduced by 25mm.